I have recently been enjoying a season of reading. This despite everyone being ill lately (we just seem to get over something when another virus hits!) and no one sleeping very well. The reason I've been able to read is because with various children needing my attention at frequent intervals, I've wanted to stay close by and not involved in a complex task. So, reading! 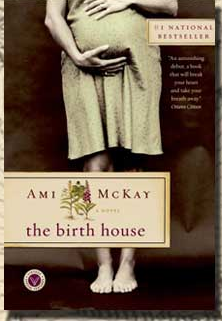 A friend lent me The Birth House by Ami McKay (Knopf Canada, 2006), and I have to say I loved it (thanks J)!! Reading it almost became a compulsion for me; I didn't want to put it down. Check out Ami McKay's website! The story centres around a young woman named Dora Rare, who lives in the very small village of Scots Bay in early 20th-century Nova Scotia. As the nearest large town is a good distance away, the women of the village are attended to by the local midwife during pregnancy and childbirth. The midwife, Miss. B., is a venerable and somewhat magical figure, who begins to train Dora to assume her role as sage femme. As Dora struggles to determine what place midwifery should have in her life, she is additionally challenged by the new town obstetrician, who pressures her to cede care of the village women to him. This is not a story about perceived benefits of midwifery versus detractions of obstetrical medical care, though tension characterized like that runs throughout the book. At its heart, The Birth House is about women, their difficulties and their decisions. Ami McKay seems to present an intentionally contradictory view of the impact of "progress" on women, as seen through Dora's encounters with the expanding domain of modern obstetrics and also the suffragist movement. The 1910's and 20's, on the one hand, saw the devaluation of female instincts and age-old womanly wisdoms (embodied here as midwifery), while, on the other hand, woman as a political and legal entity made great gains in the public sphere. Ultimately, The Birth House is about women taking responsibility for themselves and being masters of their bodies, their sexuality, their work, their roles. To me, that is a relevant story, regardless of the particular form of pre-natal and birthing care one chooses. Ami McKay fleshes-out beautifully the characters and community of Scots Bay, and she offers humour as well as poignancy. If I had to give a criticism, it would be that some of the characters verge on uni-dimensionality (e.g. as representing a certain historical paradigm) and that there's one love story in particular whose culmination I could predict a long way off (and it channelled Anne of Green Gables and Gilbert a little too much for me). Nevertheless, I thoroughly enjoyed this book, and I highly recommend it if you're looking for a good read!